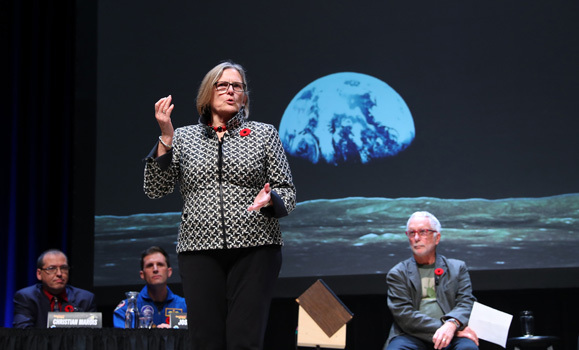 Settling a spirited "Great Debate"
With those words, former NASA astronaut and Dal alumna Kathryn Sullivan neatly summed up one of the central issues Dal 200’s Great Debate. 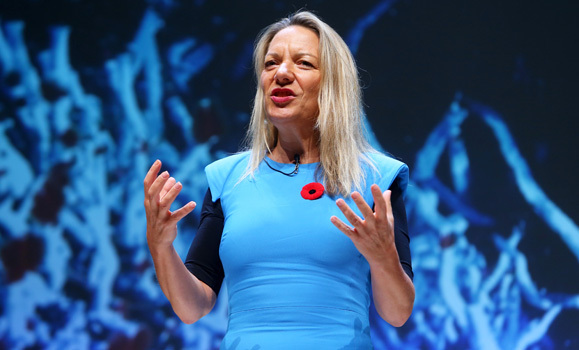 At the event’s core was a simple question, to be deliberated by six of the world’s leading minds in ocean science and space exploration: what is the next frontier, space or the ocean? But over the two-hour event it expanded into several other questions, including: is it better to look outward to space or inward to the deep ocean to solve the urgent problems facing our planet? 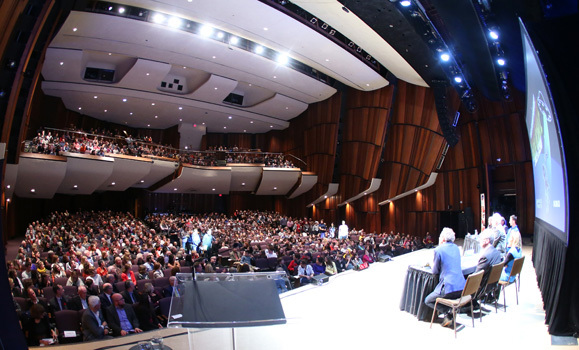 The battle for scientific supremacy was duked out Monday night (November 5) in front of a full house at the Dalhousie Arts Centre’s Rebecca Cohn Auditorium, full of young and old alike. 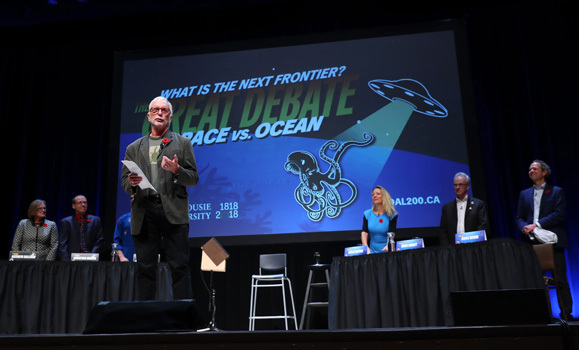 One of the culminating events of Dalhousie’s 200th anniversary celebrations, the Great Debate was moderated by author, speaker and science broadcaster Jay Ingram, best known for his time as host of Discovery Channel Canada’s Daily Planet. He bravely refereed what quickly became a passionate yet hilarious discussion, with both Team Space and Team Ocean garnering thunderous applause and raucous laughter from the delighted audience. Moderator Jay Ingram introduces the debate format. 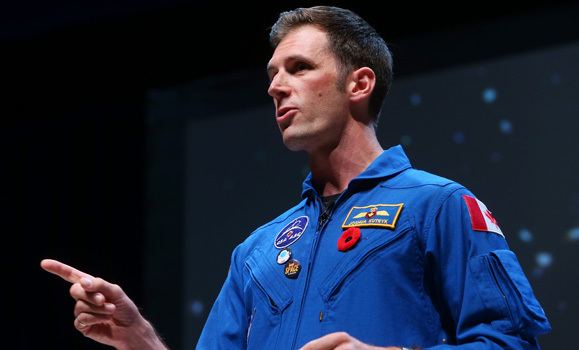 Team Space included Dr. Sullivan, test pilot and Canadian Space Agency astronaut Joshua Kutryk, and Canadian astrophysicist Christian Marois. Arguing for Team Ocean was Mark Abbott, president and director of the Woods Hole Oceanographic Institution in Cape Cod, award-winning German marine biologist Antje Boetius, and Dal’s own marine research ecologist Boris Worm. 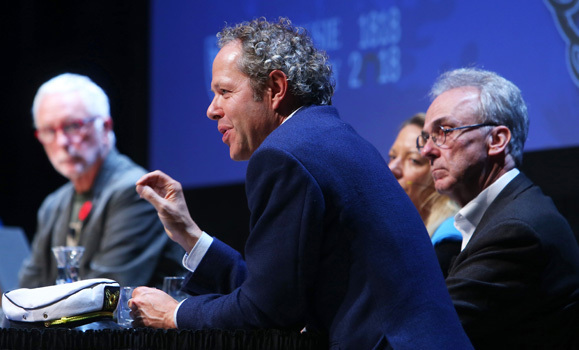 The format of the debate had each speaker deliver a three-minute “pitch” to the audience, followed by crosstalk and rebuttal from the other debaters. Dr. Sullivan led the charge for Team Space, ribbing Dr. Abbott: “When I was born, there wasn’t a space age. Mark and I have that in common.” She went on to describe watching the space program develop to the point where people from many different nationalities are able to live and work together on the International Space Station. As the debate progressed, the two sides appeared to come closer and closer together, grudgingly but good-humouredly agreeing that each benefits from the other’s research and technology. Dr. Boetius confessed to a secret love of space. Dr. Sullivan disagreed with her teammate L.Col. Kutryk about the viability of the “lifeboat theory” that humans can find a safe home on another planet in the foreseeable future. There was a spirited debate about how exciting it is — or isn’t — to grow cucumbers in space. All this pointed to a happy resolution. Dr. Sullivan even suggested that the United States government could round up the eight tenths of a penny from every tax dollar that goes to NASA to two cents to be shared equally between ocean and space research. The audience then had the opportunity to ask questions. The most impressive came from many of the 300 students from grades seven to 12 who had spent the day on campus taking part in STEMFest, a program of workshops related to science, technology, engineering, the arts, and math. In the words of Dr. Boetius, “This tiny little blue marble is worth thinking about,” whether you’re viewing it from deep within the ocean, or through the window of a spacecraft.